One of the most personal representatives of post-war lyrical abstraction, Atlan, although he belonged to the previous generation and began with artists younger than himself, is a forerunner of Art Informel with Hartung, Schneider and Wols. Born into a Jewish Berber family, he arrived in Paris in 1930 to study philosophy, in which he obtained a degree in 1933. When the war came, Atlan was called up at Laval, where he had been teaching philosophy at the lycée. From 1940 to 1941, he taught at the Lycée Condorcet in Paris, but anti-Semitic laws forced him to leave this post. With his wife Denise, he moved to number 16 rue de la Grande-Chaumière, a step which was to prove decisive. He discovered his vocation to paint in this neighbourhood of artists. At the same time, Atlan’s first poems were published. During the Occupation, which was a nightmare for the couple, he continued painting and writing. He joined the Resistance, but was arrested as a terrorist in 1942. At the La Santé prison, where he had been transferred, Atlan pretended to be mad and, in 1943, he succeeded in being interned at the Hôpital Sainte-Anne. Here he painted and wrote a collection of poems, Sang profond, published in November 1944, a few months after the Liberation. The first exhibition of Atlan’s paintings was held in December 1944, at the Arc-en-Ciel, a gallery-bookshop in rue de Sèvres. His work met with a favourable reception from the public, although there was surprise at the expressionist figurative style, with its thick paint in which figures and birds appeared. The following year, four non-figurative paintings, already suggestive of his future work, were shown at the Salon des Surindépendants. In February 1946, a second exhibition of Atlan’s work was held at the Galerie Denise René. This was followed, in 1947, by an exhibition at the Galerie Maeght (with a catalogue text by Jacques Kober) of 27 paintings for the publication of Kafka’s Description d’un combat, for which in 1946 Atlan had made lithographs at Mourlot’s workshop, shown in November 1947 at the Hôtel du Pont Royal in rue Montalembert. This was a period of success for Atlan, during which he participated in a number of group exhibitions: Le noir est une couleur in December 1946, Sur quatre murs in 1947 at Maeght, and L’Imaginaire organised by Mathieu with a catalogue text by Jean-José Marchand at the Galerie du Luxembourg. In 1947 Atlan participated in the second Salon des Réalités Nouvelles. From 1947 to 1956 Atlan went through a period of insecurity. Wishing to regain his independence, he left the Galerie Maeght. Although he was now without a dealer in France, he showed abroad. In October 1948 he exhibited at the Art Club in Vienna and, in December of that year, at the Salon Corner in Copenhagen (with texts by Michel Ragon). In 1949 Atlan exhibited at the Galerie Egon Günther, in Mannheim in Germany and, later in the year, he showed his pastels and drawings at the Galleria Sandri in Venice. That year he also sent in a first painting to the Salon de Mai, where he was to show until the end of his life, receiving a tribute in 1960. In 1951 the first book about Atlan was published, L’Architecte et le Magicien by Michel Ragon. Despite his success, his work remained ambiguous. A divergence subsisted between the ‘abstracts’ and Atlan’s works. In a text written in 1946, Clara Malraux had already drawn attention to this division:”Atlan would like to stir us through pictorial means. But these pictorial means are placed at the service of an inner world which is hallucinatory, obsessive, strange and, nonetheless, communicable to the extent that it seems to awaken recollections in us. This generates a kind of ‘materiality’ which sets him apart from the world of those we refer to as ‘the abstracts’ ” (La Nef, Paris, March 1946). His work testifies to intense creative activity. The support of a number of loyal collectors (Gertrude Stein and Jean Paulhan were among the first to buy his paintings) was however insufficient, and this was a difficult period for Atlan and his wife. He showed at the Biennale de Menton in 1951, 1953 and 1955. In 1951, he took part in the Exposition Internationale d’Art Expérimental in Liège and, from 1953, his work met with increasing success in Japan. In 1953 he exhibited in Israel and the following year in Yugoslavia. In 1955 and 1957, he participated in the Sao Paulo Biennial. In order to make ends meet, he sold hosiery at suburban markets. This did not discourage him, though, from continuing to paint with enthusiasm. Few paintings, however, remain from this period as, to save money, Atlan often reused his canvases. The paintings that have survived are nonetheless of great quality. The heavy impasto of the early works gradually gave way to a style that evoked first a floral world and then later an animal world. 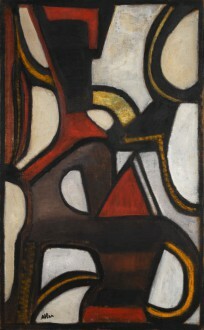 Painted with bitter violence, using a restricted palette of ochres, yellows, reds and black, anthropomorphic marks etch their black forms entwined in curves around bristling pikes. A magical, primitive world in which plant and mineral are closely related to a bestiary that emerges from the depths of the earth and its forests. The energy of Atlan’s lines, combined with the rhythmic quality of his paintings, gives them an incantatory strength. Throughout these years, his studio was always full of visitors, his warm personality attracting writers (Marcel Arland, Clara Malraux and Jean Duvignaud) as well as artists (Mathieu, Soulages, etc.). At his famous Saturday evening gatherings, the lively conversation lasted late into the night. In 1955, Atlan was invited to participate in the annual École de Paris exhibition at the Galerie Charpentier, for which he executed a poster. He again participated in the exhibition in 1956, 1957 and 1958. A revival of interest in Atlan’s work now began, marked by his first solo exhibition in Paris since 1947, held in November 1956 at the Galerie Bing. The critics were not unanimous in their appreciation, and several disapproved of the new direction his work was taking: “Atlan has re-emerged after several years out of the limelight… His field of expression has widened, and the work has more force,” though this is followed by an admission of “the monotony of these paintings… and their inner monotony” (Léon Degand, Art d’Aujourd’hui, 1956). Roger V. Gindertaël, on the other hand, made no attempt to disguise his enthusiasm, and wished to “simply insist on the impressive action of the imaginary structures that Atlan develops with such passion” (Cimaise, November–December 1956). We should mention his participation in the Nouvelle École de Paris in Tokyo in 1955 and 1957; the exhibitions at the Galerie Ariel in Paris with Situation de la peinture d’aujourd’hui in 1955, 1956 and 1957; the Galerie La Roue in Paris with Eloge du petit format in 1955 and 1956; Galerie Arnaud with L’Aventure de l’art abstrait in 1956 and Festival de l’Art d’avant-garde in Marseille; Galerie Le Gendre in Paris with Expression et Non-Figuration in 1957; Cinquante ans de peinture abstraite, Galerie Creuze. Salon Comparaisons, 1958. A number of solo exhibitions were held in 1957: Galerie Dupont, Lille; Palais des Beaux-Arts, Brussels; and Musée d’Antibes (with a catalogue text by André Verdet). In 1958, he showed at the Galleria Naviglio in Milan, and also had a travelling exhibition in Germany. Atlan’s artistic mastery was impressive. His paintings have the strength of totemic emblems, with a rhythmic power that lends them grandeur. In 1958 he bought a house at Villiers-sur-Tholon in the Yonne, where he spent most of his time. In 1959 he exhibited at the Galerie Roux-Malaval in Lyons and the Kaplan Gallery in London (with a catalogue text by Georges Le Breton), and at the end of the year once again showed at the Galerie Bing, which also gave him a retrospective in 1965 (catalogue text by Waldemar-George). Atlan died in his Paris studio on 12 February 1960. His last paintings were shown in March of that year at the Contemporaries Gallery in New York, with a catalogue text by Clara Malraux. Hommage à Jean-Michel Atlan: Cimaise, April–June 1960. Rétrospective, Musée National d’Art Moderne, Paris 1963. Catalogue. Atlan, works in French public collections, Centre Georges Pompidou, Paris, 1980. Catalogue with texts by Atlan and a catalogue of prints and illustrated books. Biography. Atlan, premières périodes 1940–1954, Musée des Beaux-Arts, Nantes, 1986. Catalogue. Reprinted 1989. Atlan. Galerie Enrico Navarra, Paris, 1989. Catalogue, poem by Michel Butor. The Museums of Antibes, Grenoble, Lille, Lyons; Paris: Centre Georges Pompidou, Musée d’Art Moderne Ville de Paris; Tate Gallery London, Cologne, New York Museum of Modern Art, Tokyo, Haifa, Stuttgart. André Verdet, Atlan, Le Musée de Poche, 1957. Michel Ragon and André Verdet, Jean Atlan, Coll. Les Grands Peintres, Kister, Geneva, 1960. Michel Ragon, Atlan, Le Musée de Poche, Georges Fall, 1962. Bernard Dorival, Atlan, Essai de biographie artistique, P. Tisné, 1962. Michel Ragon, Atlan, Mon ami, Galilée, Paris, 1989.